Save money over the long run! Is hose failuare costing you money? Hidden costs can drive up the price of cheap hoses. 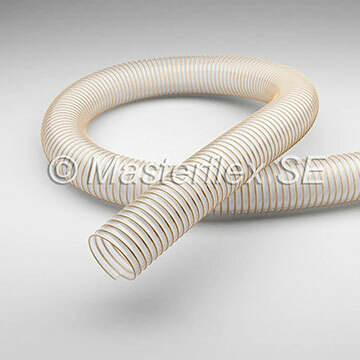 Static dissipation has become an important feature for hoses in dust collection systems. Hoses are used to transport solids, as well as liquids and gases, and can be a potential source of danger due to the build-up of electrostatic charges. Electrostatic charges occur whenever solids that are nonconductive with poor conductivity, come into contact with other materials and then are separated again. The end result of this friction is the discharging of potentially dangerous sparks. The capacity to dissipate such charges is therefore mandatory in many applications to ensure safe operation. There are a number of ways to avoid such discharges, and Masterduct has a solution! Also see A Helpful Hose - Know Your Hose! to ensure a safe working environment. Flame-resistant to protect workers from risk of fire. Smooth inner wall promotes optimum flow and reduces clogs. Guaranteed top quality products and knowledgeable, friendly representatives to provide superior service every step of the way! The Master-PUR hose series is engineered with an eye toward safety to eliminate static electricity at the source and help ensure safety in the workplace. 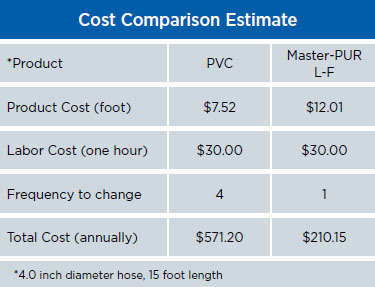 MASTERDUCT’S innovative PUR hose construction, utilizing an FDA compliant polyester polyurethane, makes it highly abrasion resistant. An optional, washable, stainless steel helix is available for when safety is critical between uses. The Ultra-smooth inner wall promotes optimum flow and reduces clogs. 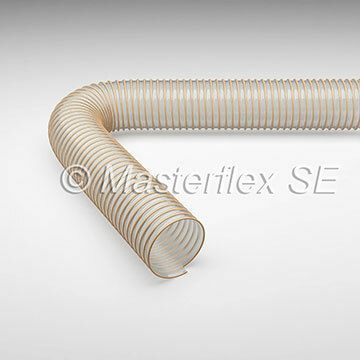 The Master-PUR "F" hose series is extremely flexible for easy maneuverability. Ideal for dust collection and applications that demand constant movement. 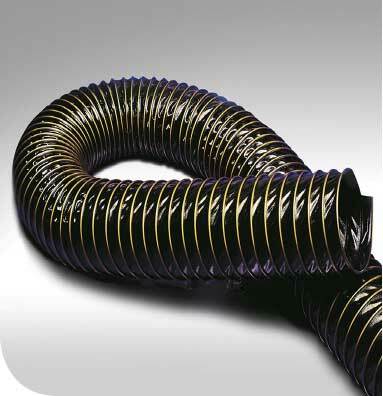 The highly robust, Master-PUR "X" hose series features an even smoother inside wall for optimum flow. The one-step, extruded manufacturing process guarantees a longer wear life over other PUR hoses. Lightweight and extremely flexible for easy maneuverability. Ideal for dust collection and applications that demand constant movement. Medium weight, highly flexible and more abrasive-resistant. Ideal for CNC machines and applications with more abrasive media, such as wood chips. Heavyweight, flexible and extremely abrasion-resistant. Ideal for extremely abrasive media and applications that require less flexibility. 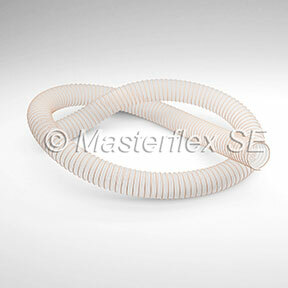 Also available with a stainless steel helix or an electrically conductive polyurethane. A more rugged hose engineered to withstand continuous flexing. The thermoplastic polyurethane is reinforced with a high strength woven polyester fabric that has excellent tear & puncture resistance. 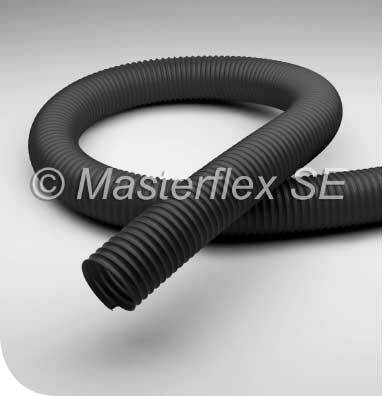 An economical, general purpose hose manufactured using a thermoplastic elastomer fabric, which works well in dust collection systems. Search additional hose solutions for the woodworking industry.